The USA Groom Team has chosen www.petgroomerapparel.com to go for the gold in Italy while wearing Pet Groomer Apparel designed by local San Diego businesses: Pet Groomer Apparel and Bow Wow Beauty Shoppe. The USA Groom Team has chosen www.petgroomerapparel.com to go for the gold in Italy while wearing Pet Groomer Apparel designed by local San Diego business Pet Groomer Apparel. Nearly 10 years, several business awards, news articles, and television spots including Fox News, KUSI News, “Pet Elite Magazine,” “Groomer To Groomer Magazine,” and San Diego A-LIST; Ms. Michelle is considered a leading expert for the Pet Grooming and Pet Boutique industry due to the creation of her retro dog boutique and dog grooming salon: Bow Wow Beauty Shoppe. Keeping in line with her passion for raising professional standards in the pet grooming industry; Ms. Michelle designed a line of pet grooming apparel: www.petgroomerapparel.com. 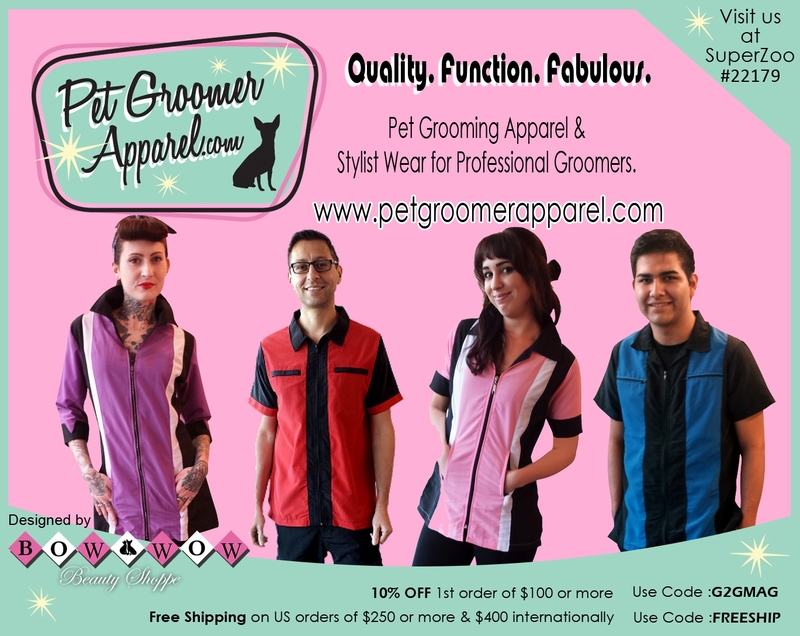 The design, quality, and function of Pet Groomer Apparel has led to World renown groomer support and wear of Pet Groomer Apparel for their major competitions, speaking engagements, and staff uniforms. Top Grooming Industry professionals such as USA Groom Team members Lindsey Dicken, and Veronica Frosch, are among the multitude of leading pet grooming industry professionals to support the design and quality that has become synonymous with Pet Groomer Apparel. Industry support combined with luck and savvy, has led to the exclusive uniform design for the 2015 Gold hopeful: USA Groom Team. Shop for Stylist, Barber, and Pet Grooming Apparel where quality & function meet Fabulous!